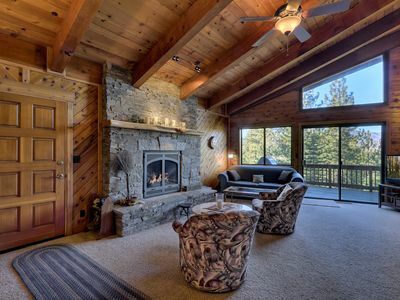 Just like the three bears of fairytale fame, you will find Goldilocks Cabin "just right"! 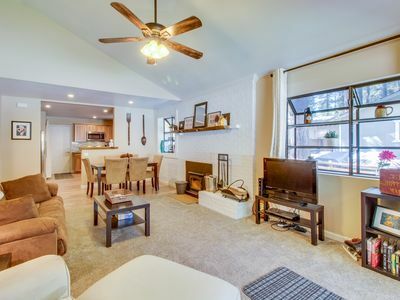 With 4 bedrooms and two and 1/2 baths, it is spacious, well-appointed and beautifully decorated throughout in upscale 'Tahoe' style. The huge modern kitchen has stainless appliances and an island perfect for entertaining large groups. 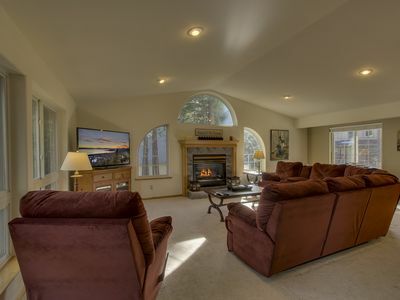 The living room features a flat screen HD LCD TV with cable and free Showtime, HBO and Cinemax, DVD with shelves full of movies, and comfy furniture to sink into after a day on the lake or slopes. 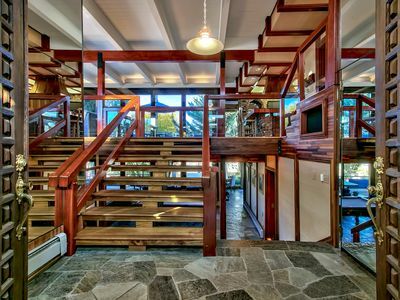 There is a beautiful glass-enclosed fireplace viewable from the kitchen, dining and living rooms. 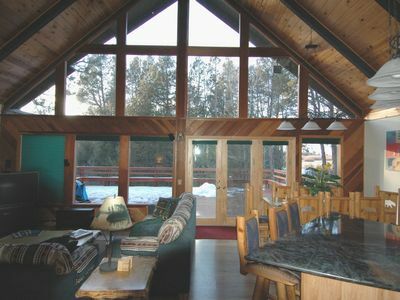 Nine foot ceilings and numerous windows complete the luxurious feel of our home. 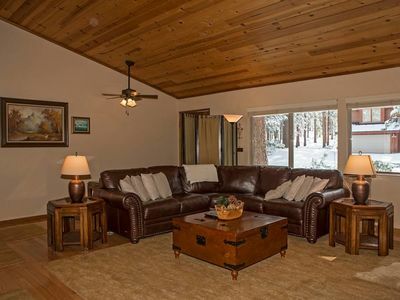 The master suite includes fabulous furnishings, an HDTV & DVD player, walk-in closet, and spacious private master bath with a romantic two person soaking tub and shower as well as dual vanity. 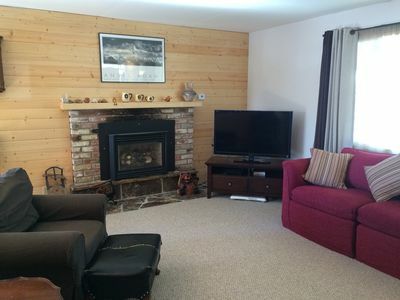 One of the two cozy queen bedrooms also has an HDTV. The fourth bedroom is a perfect room for children or adults and features sturdy log-style twin bunks and an extremely comfortable double bed. 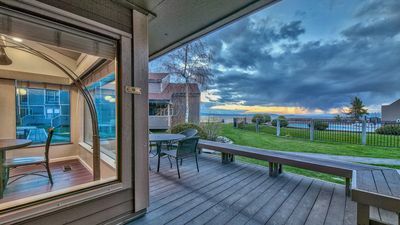 The front porch is the premier place to relax in a rocker and enjoy the neighborhood and has a "peek" view of the face of Heavenly. 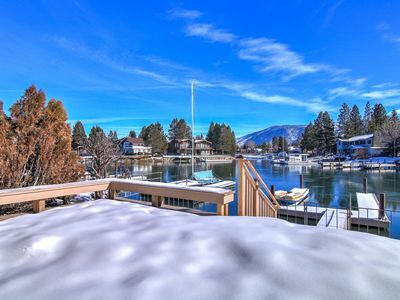 The private backyard is perfect for a summer barbecue or year-round hot tub fun. 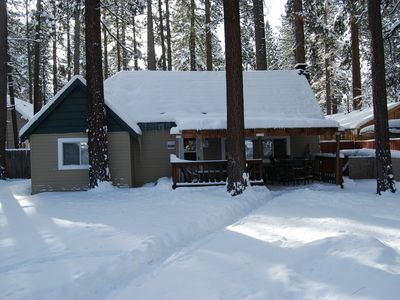 The Al Tahoe area is user-friendly every season of the year. 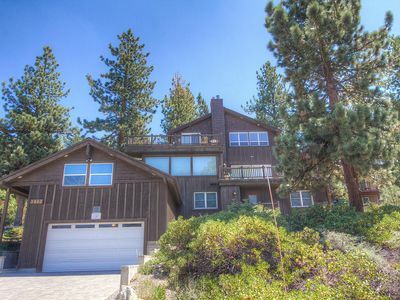 This lovely home is 4 very short blocks from the lake (less than a 2 minute walk) and just 2.5 miles from the casinos and the world-class Heavenly Ski Resort. 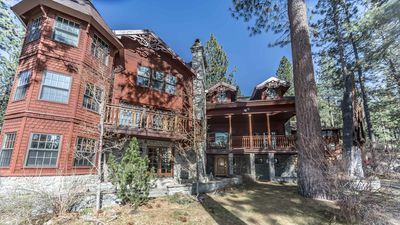 Another ski resort, Sierra-at-Tahoe, is a quick 20 minute drive. 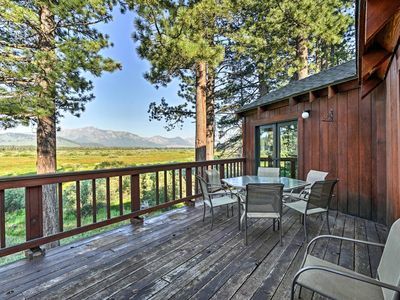 Goldilocks Cabin is located between two of South Lake Tahoe's most popular beaches: Regan Beach and the newly renovated Lakeview Commons at El Dorado Beach. There is a boat ramp adjacent to El Dorado Beach. 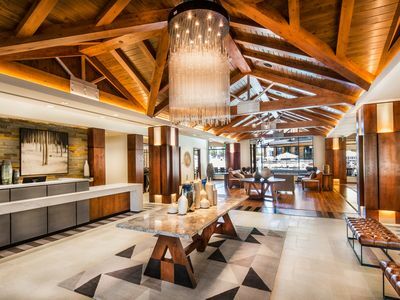 A wide array of shops and restaurants and so much more is within walking distance. 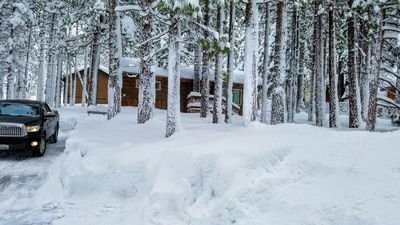 Please visit the Goldilocks Cabin website listed below to view a complete gallery of photos, to peruse the availability calendar and to map the location. 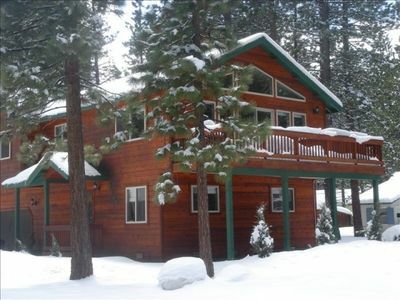 South Lake Tahoe is a quick drive or boat ride from the beauty of world renowned Emerald Bay. 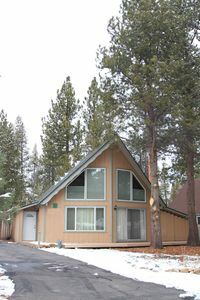 City of South Lake Tahoe permit #002649. 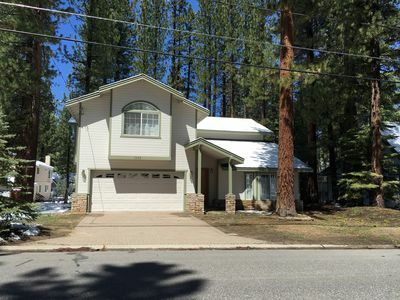 Keywords: Spacious private home, walking distance to the lake, 2 popular beaches, and 5-10 minutes to the casinos, Heavenly Ski Resort, hot tub, WiFi, comfortable, clean, family friendly. 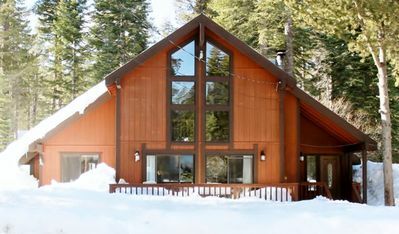 West Lake Tahoe Chalet, 3 bd/2bth, Hiking, Biking, Skiing, Sledding, Sleeps 8. 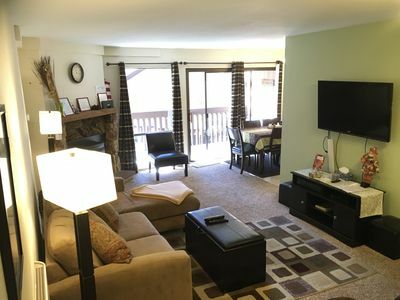 Alpine home w/ great location, close to skiing & hiking, 2 small dogs OK! 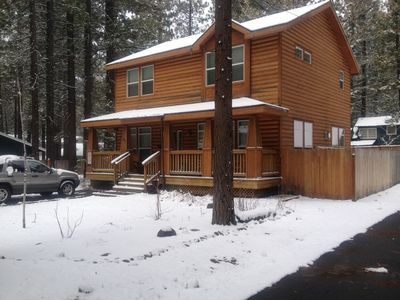 Cabin on Meadow/Creek - Walk to South Lake Tahoe!